My first trip up since the storms at the beginning of the week and there’s a fair bit of damage on site. My culticave didn’t survive. It’s over by to the cemetery fence…the wind snapped the guy ropes and it must have cartwheeled over there because my pea seedlings are scattered Everywhere. 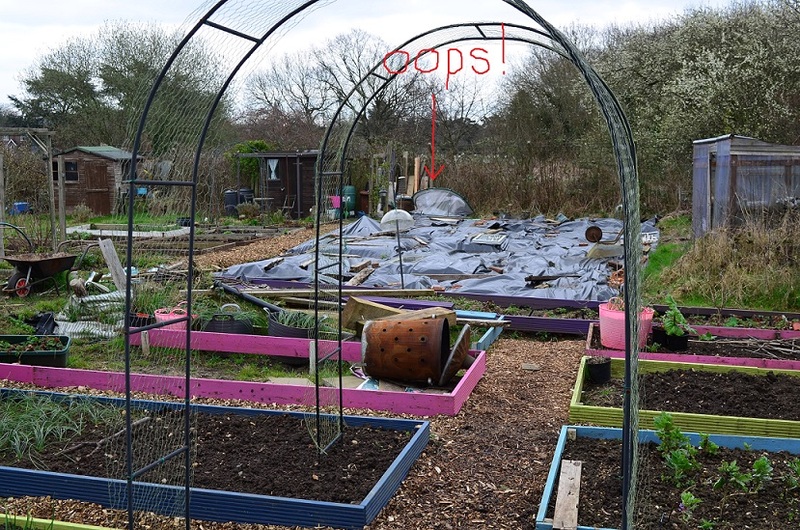 Poor Phil’s worse off – his greenhouse has been shifted and twisted, and glass shards are all over the place, despite our efforts to clear it up a bit. You can see from the photos how wet it is on my plot. With bright orange clay underneath it takes forever to be workable. 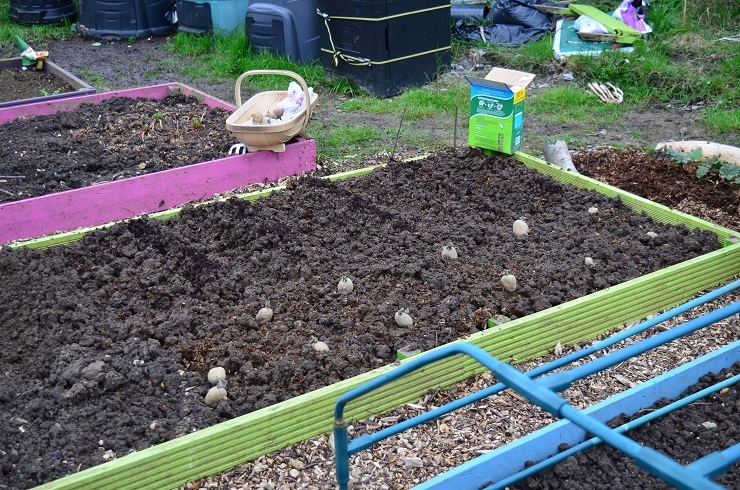 I planted out some Lady Christls in a really soggy bed (no digging involved, the spuds were popped in at a trowel’s depth and then earthed up after. They are a lovely variety, gorgeous creamy flavour, prolific and a nice even shape. Plus they are super quick to grow. I’ve brought the rest home to wait till the bed has had a chance to dry out some more. Not that there is quite room enough for all of them where they are supposed to go. This happens nearly every year – I re-jig my plans so much that by the end of the season my plan and what I actually grew are two very different things. 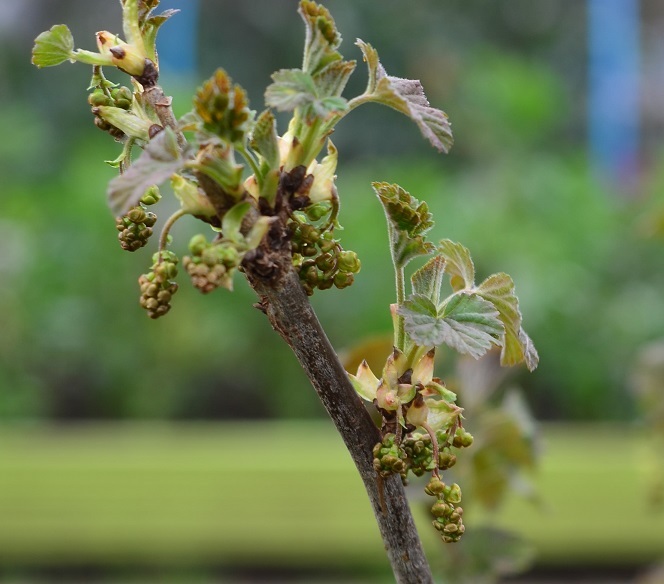 My redcurrants are flowering already – even the ones which were transplanted from Mum’s 3 weeks ago, which can’t be brilliant for them…I’m not sure whether I should pick all the flowers off or not to give the plants a bit of a break. Last year’s layering on my other fruit bushes has worked too and I have a new Jonkheer van Tets twig as well as 2 more Hinnomaki Reds. I am trying some more fig cuttings as the one in the pot came to nothing. This time I’m keeping the fig twigs at home in the warm and covered, though I am desperate to peek now I can see green leaves through the hazy plastic. At home nearly all the tomatoes are up. And I need to sow more peas. Which means the seedling extension shelf is going up and I will need to put up with some grumblings about plants taking over the flat.